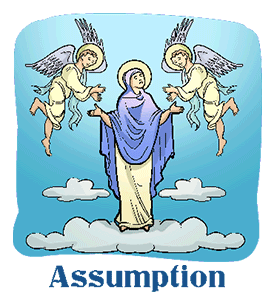 ﻿Assumption of Mary: Calendar, History, Tweets, Facts & Activities. The Assumption of Mary commemorations her ascension into heaven. Traditionally Roman Catholics believe Mary, the Virgin mother of Jesus, never physically died and instead ascended into heaven. Mary, as the mother of God, is believed by some Christian faiths to have lived a life without sin. Some early-church theologians believed that since she and Christ were both without sin that Mary must have raised bodily to heaven just as Christ was. This belief began the feast of the Assumption of Mary. The Assumption is typically observed on August 15, except if this date falls on a Saturday or Monday. For this case, some Christian denominations observe it on the adjacent Sunday instead. NO CLASSES TODAY. Happy Feast of the Assumption of Mary, UICians! The Assumption of Mary isn't in the Bible. The theology it is based upon is from several early church documents and sermons. The Orthodox Church continued the tradition, but it didn't become doctrine in the Roman Catholic Church until 1950 when Pope Pius XII declared the belief infallible. Thomas was the only disciple who purportedly saw Mary's ascension into heaven. In a reversal of his story in scripture, the other disciples didn't believe him at first. Mary dropped her girdle when she reached heaven, and Thomas caught it. The Feast of the Assumption of Mary is a high feast Day in the Roman Catholic Church and the Orthodox Church. The day venerates the assumption into heaven of Mary, the mother of Jesus. It is held on August 15. In the Orthodox tradition, the feast, called the Dormition of the Theotokos, is held the same date, although the day may be later for churches that follow the Gregorian calendar. Mary, Mother of God, pray for us sinners, and guide us on the way that leads to Heaven. - Pope Francis on the Feast of the Assumption via twitter on Aug 15, 2013. Attend an Orthodox Church during the Feast of the Assumption to see the blessing of flowers. Historically, both flowers and herbs are brought to church as offerings or to be blessed during the Feast of the Assumption. Start an herb garden or plant some bulbs to bloom in spring in honor of Mary. The Assumption of Mary is a popular subject in Christian art. One of the most famous is The Assumption of the Virgin , by El Greco and available for viewing in the Art Institute of Chicago. See if your local art museum has paintings of the Assumption. Many faithful in the Orthodox Church will also be breaking a two-week fast after the service honoring the Assumption of Mary. If you are fasting attend a community meal offered by many Orthodox Churches.